This is the best of this series so far. It was different from the ones preceding it, but beautifully written and emotional. I went back and forth between the ebook and the audiobook and really enjoyed Cosham's voice. I also liked hearing the author's interview about the book at the end of the audio recording. I read this with three Instagram friends and really enjoyed it. I avoided scary books like the plague as a kid, but this one has great character development. I'm already planning to read at least the next two books in the series. This was a read-aloud with my four-year-old. It's the weakest of the four books we've read from this series so far, but she still enjoyed the time the Hollisters spent searching in caves for stolen treasure. I started this on audio, got fed up with all the random chapters about characters not connected to the main plot and plowed through the rest in the ebook edition. It was fine, but not as good as I'd hoped. I read this quick, light celebration of the reading life in just two days. It's a really fun little book in which the blogger behind Modern Mrs. Darcy shares her observations about the habits of readers. The Diva Runs Out of Thyme by Krista Davis, audiobook read by Hillary Huber 50%I'm really enjoying this audiobook. Krista Davis is one of the best cozy mystery writers, and I love all the characters in this book. I was halfway through this book a week and a half ago when my loan period on Open Library ended. I put myself back on the waiting list for it, and of course, as I soon as I started a bunch of other books, it became available again. I will definitely finish it before it expires this time. I've been meaning to read this book for months to satisfy the letter "Q" for the A to Z Challenge hosted by Ginger Mom and the Kindle Quest. It's a quick read and I will probably finish it today. I love this series, and it's been a little while since I read book 4, Send in the Clowns. So far, it's every bit as good as the earlier titles of the series. This author's writing style really clicks for me. My husband brought home a stack of Catholic and homeschooling books for me to read. I'm starting with this one because it's quick, and the subject matter is far removed from anything else I'm reading. So far it's dwelling a lot on hoarding. This book was mentioned by Anne Bogen in I'd Rather Be Reading. I normally don't read much involving magic or fantasy, but this book appealed to me in spite of that, so I'm giving it a try. So far, I like the writing a lot. My loan period for this book also expired a couple of weeks ago, and I put myself on the list again, and my turn came up again a couple of days ago. I'm going to try really hard not to let time run out again! 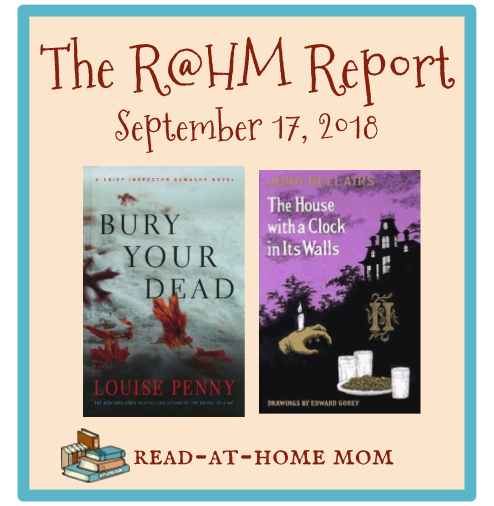 I've heard so many good things about Louise Penny! I really want to read some of her books soon. Wow! What a nice variety of books. I liked Montana Sky - but then, Nora Roberts is a must-read author for me. Come see my week here. Happy reading! I'm curious what you think of Not of this World: A Catholic Guide to Minimalism when you finish. I've read a bit on the topic of minimalism, but this one might be a different approach. Thanks for sharing, Katie! I still have to read The House With The Clock In Its Walls. It sounds like the kind of book I would have loved as a kid. Have a great week. Hope you enjoy Garden Spells by Sarah Addison Allen. I am a big fan of her work. How I would love to be buried under the book "I'd Rather Be Reading" and presenting that face to the rest of the world like all. the. time. :) Thanks for sharing all these great books this week.